Cheng Ming, 47, works as a masseuse at Tonghe Hospital in Xiangyang City, Hubei Province. Although she hasn't been able to see anything since birth, in her mind, there is no difference between herself and other people. In the first half of the 1970s, Cheng and two younger sisters were born in succession in Qianjiang. Due to congenital blindness, Cheng usually fell down when she was learning to walk, which tended to turn their house into a bit of a mess. However, Cheng's parents never blamed her; instead, they encouraged her to step out bravely and told her sisters to take care of Cheng. In addition, Cheng's parents grasped every opportunity to present a vivid world to their blind daughter. From furniture to outdoor facilities, from green plants to animals, they made every effort to create a complete picture of each object, while also asking their younger daughters to read books to Cheng. Thanks to the family's help and encouragement, Cheng began to become familiar with the strange world around her. Through their vivid descriptions, she got to know what a speeding car "looked" like; the sight of snow and rain and what the latter sounds like; and they helped her to understand the concept of color – of grass and flowers. Cheng said, "Although I can't see the colorful planet with a normal person's eyes, I have already 'seen' a bright and splendid world through my family's mouths." At 6 years old, Cheng was sent to Wuhan, capital of Hubei Province, to study at a vocational school for the blind. She graduated in the 1990s, and began to use massage in medical treatment in her hometown. Ji Weiqian is one of Cheng's patients, and also a member of a local running team. She liked to share what she saw and heard with Cheng, making the latter wonder whether she could run, too. Cheng said, "Sometimes I was thinking as a disabled person, how many things are there I can't do like sighted people?" Last August, Cheng told her sister that she planned to take part in a mini- marathon. To her big surprise, her husband and two sisters supported her very much, and her youngest sister even promised to run with her. On Oct. 23 last year, Cheng stood on the start line of the Yichang Marathon with her sister standing beside. Their wrists were linked by a red thread rope to prevent Cheng from colliding with or being knocked by others. Thanks to her sister's help, Cheng finally finished the race, becoming the only blind runner to reach the finish line. While having her picture taken holding the souvenir medal after the 10-kilometer run, Cheng said it was the happiest moment of her life. Finishing a mini-marathon seems to have opened a new window in Cheng's life, and she began to wonder if she could run further. On April 9, the Wuhan Marathon will be held in the capital of Hubei Province, and that has become Cheng's next goal. Having studied in Wuhan for more than one decade when she was young, Cheng has a special affection for the city. By participating in the marathon, she also wants to have a chance to travel around the city again and recall childhood memories. However, for a blind runner, to finish a full marathon of some 42 kilometers is much more difficult than any of her previous experiences. Since the end of last year, Cheng's families and friends have worked hard to design a special training for her. 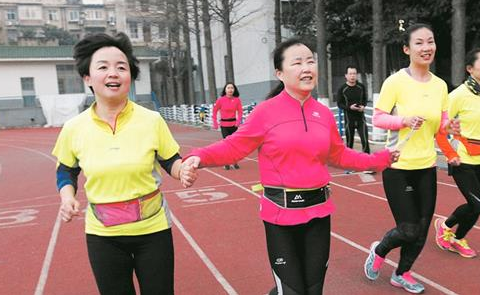 Besides her daily routine training, Cheng has to finish a 10-kilometer run every week, taking about 70 minutes. But if she wants to finish a half-marathon, just over 21 kilometers in total, she must do much more training from now on. Cheng really appreciates her family and friends being her companions on every run. However, what she doesn't know is that her perseverance and courage also inspires other people to live better lives. Although not being able to see anything since birth, Cheng Ming believes there is no difference between herself and other people who have their sight.